Volume1 is a joint register with Lulsley. Suckley Parish Registers also include some entries relating to this parish. 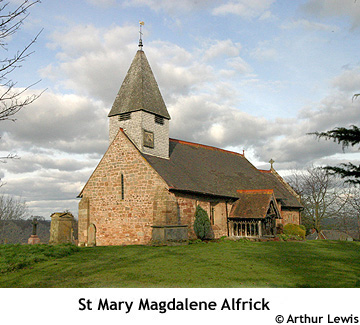 ALFRICK, a chapelry in the parish of SUCKLEY, upper division of the hundred of DODDINGTREE, county of WORCESTER, 7 miles (W. by S.) from Worcester, containing 445 inhabitants. The chapel is dedicated to St. Mary. Here is a free school, with an endowment of £10 per annum.